UK developer Playtonic has removed YouTuber JonTron's small Yooka-Laylee cameo following a controversial outburst. Popular YouTuber Jon "JonTron" Jafari recently found himself in a bit of hot water concerning a racially-charged political rant in which, among other statements, he claimed that Mexican immigrants are attempting to claim parts of America. He has reportedly lost a number of subscribers on the back of the controversy, and now, Platonic has announced that the YouTuber's small cameo appearance in upcoming platformer Yooka-Laylee has been removed. "JonTron is a talented video presenter who we were initially, two years ago, happy to include as a voice contributor in our game. 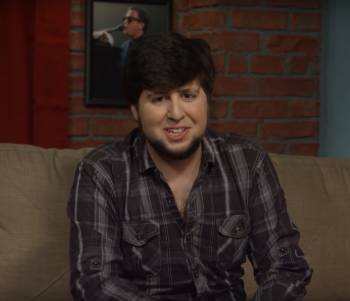 However, in light of his recent personal viewpoints we have made the decision to remove JonTron's inclusion in the game via a forthcoming content update," said the developer in a statement to Gamesindustry.biz. "We would like to make absolutely clear that we do not endorse or support JonTron's personal viewpoints and that, as an external fan contributor, he does not represent Playtonic in any capacity. Playtonic is a studio that celebrates diversity in all forms and strives to make games that everyone can enjoy. As such, we deeply regret any implied association that could make players feel anything but 100% comfortable in our game worlds, or distract from the incredible goodwill and love shown by our fans and Kickstarter backers." In 2015, JonTron was invited by Platronic to voice a minor character in the game.